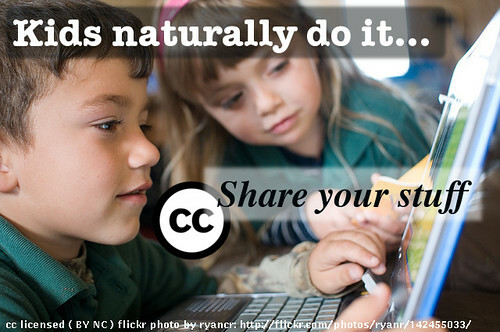 Use creative commons licensed images to design a poster about how groovy Creative Commons is! Use a tool like Compfight to find creative commons licensed images in flickr (be sure to select the right option on the search pane), and then use photo editing software to add your message, call to arms, rallying cry, urgent plea. INclude as well a creative commons logo– look to the creative commons itself for ones to use. 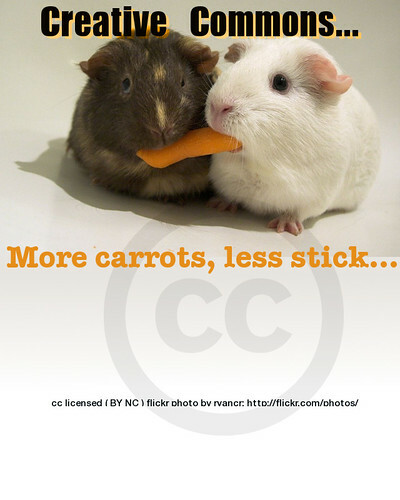 Most importantly, in your poster be sure to give attribution credit to the source image. Lest you think we want blind allegiance, if you do not like creative commons or want to have fun with it, do the opposite; create a poster that makes a case that creative commons is a commie pink plot of subversion. This is the thing about ds106- you never should take the assignments literally- mess with ’em. To get this going, I quickly put together some posters in GIMP (I miss Photoshop, I miss Photoshop, I miss Photoshop, I miss Photoshop, I miss Photoshop, I miss Photoshop…) doing some simple layering, using fills with background to make text more readable, some transparency fudging. I had trouble getting my attribution to paste into the text editor box, so I resorted to putting it in a text file, and opening it from the file.